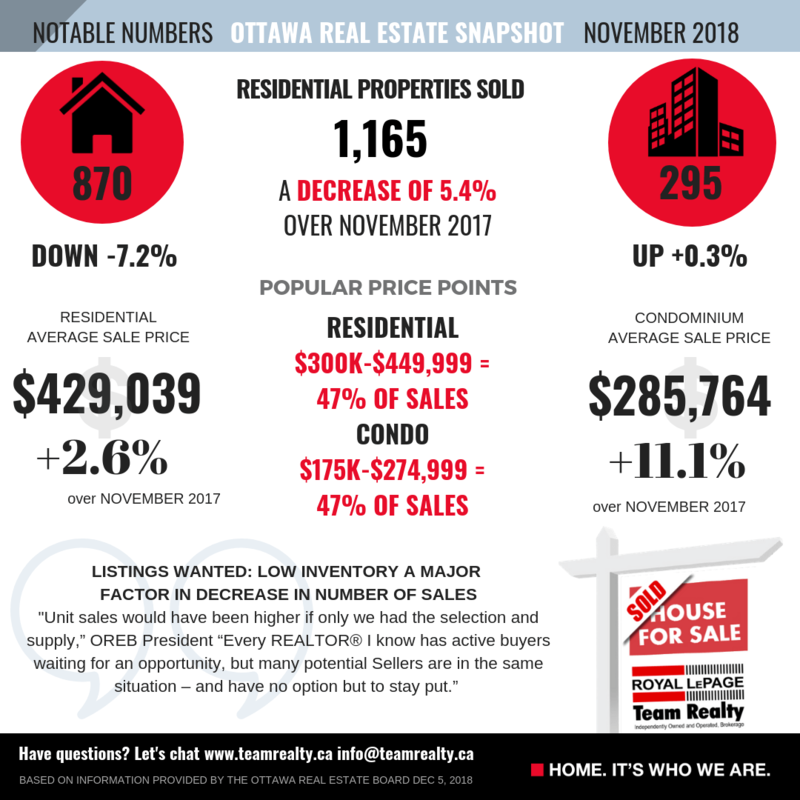 While most markets across Canada are cooling, Ottawa’s market performance is strong and steady as it has been for many years. Ottawa’s housing affordability and high employment levels shelter us somewhat from the dramatic swings that can cause instability. Sales were down 5.4% from November 2019, however experts say that wouldn’t have been the case if inventory was higher. 1,165 residential properties were sold in November (MLS®) System, a decrease of 5.4% compared to November 2017. The five-year average for November sales is 1,055. November’s sales included 870 in the residential property class, (down 7.2% from a year ago) and 295 in the condominium property class, an increase of just one unit or 0.3% from November 2017. Residential Average Sale Price was $429,039, an increase of 2.6% over November 2017. “Even though home sales are down this month compared to a year ago, this is simply a reflection of the lack of inventory that we have been experiencing all year. Unit sales would have been higher if only we had the selection and supply. Every REALTOR® I know has active buyers waiting for an opportunity, but many potential Sellers are in the same situation – and have no option but to stay put,” OREB president Ralph Shaw.